A small item in the Marine Technology Reporter just clued me in to what looks to be an interesting new line of acoustic imaging products that could have potential to augment, or perhaps reduce the need for, repeated seismic surveys of active oil and gas fields. PanGeo Subsea has announced new financing to develop their Acoustic Zoom, which they compare to a “deep earth telescope” capable of providing detailed imagery of subsea geology down to 6000m below the sea bed. Current information does not clarify any details about the products’ acoustic output. Most companies now utilize repeated seismic surveys in order to track the depletion of offshore oil fields; doing repeated 3D seismic surveys over time is termed “4D” surveying. According to a recent PanGeo press release and backgrounder, one of the major limitations of current marine 4D surveys is that the resolution at reservoir depths is often too coarse to be able to focus the seismic attributes to a specific compartment or feature of the reservoir. Their Acoustic Zoom is pitched as a novel high resolution method which uses steered beams on reception and on transmission to produce images with higher definition than can be attained with conventional seismic techniques. They project that it will “reduce the cost, scheduling and logistics involved with 4D seismic imaging, including reductions in the amount of equipment, data acquisition time, as well as the time to compute and interpret seismic results. We expect our technology to become an important tool for permanent reservoir monitoring applications.” To , read more about the Acoustic Zoom, see the these two press releases, announcing private funding received in July, and Canadian government funds received in February. There is no information on the company’s website about the source levels or frequencies of the acoustic pulses used by any of their innovative systems. In addition to the Acoustic Zoom, which is still under development, PanGeo has previously brought to market two related products, the Acoustic Corer and the Sub-Bottom Imager. The Acoustic Corer provides high-resolution images that can be manipulated in great detail; each scan covers an area 14m in diameter and 30-80m deep. See this page for three videos of the Acoustic Corer and its data. The Sub-Bottom Imager is an ROV that moves along the seabottom, making images 5m wide and 5m deep. Both of these products are more oriented toward pre-construction surveys to help avoid surprises as infrastructure is being placed on or into the seafloor. “As goes Maine, so goes the Nation?” While this old political truism has faded in recent decades, the State of Maine is currently blazing trails in carefully considered wind power development. At the local level, small towns continue to pass moratoriums and strict setback standards. Most recently, Thorndike became the third town to set a one-mile setback, with the neighboring town of Dixmont taking up a similar ordinance at this week’s town meeting. Meanwhile, two more towns, Avon and New Vineyard, joined four others who have hit the pause button on any wind farm developments by adopting moratoriums on any permits. These actions come in the wake of three projects that have generated significant noise issues for neighbors out to as far as 3000-3500 feet; thus, half-mile setbacks are being seen as not enough to avoid risk of disrupting rural lifestyles. While these towns see the state as being overly aggressive in supporting ridgetop wind farms (abetted by the fact that a former Governor is one of the state’s leading wind developers), when it comes to offshore wind development, the state’s goals will be much more welcome for most coastal communities. Instead of opening Maine state waters to windfarm leasing, the legislature’s Committee on Utilities and Energy is redrafting controversial ocean windfarm bill LD 1810 to do the very opposite. Under changes to be finalized today at the committee’s 2nd worksession on the bill, “An Act To Implement the Recommendations of the Governor’s Ocean Energy Task Force” will focus Maine instead on constructing floating deepwater windmills on land, and then deploying them at locations ten miles offshore and further, where wind speeds and higher and more consistent and fisheries are less impacted. 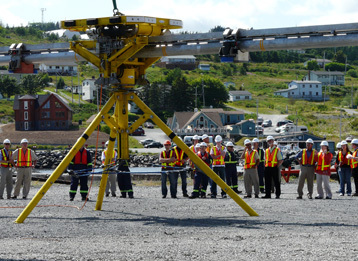 UPDATE: The offshore Maine project will not have its first scale model test unit in the water until 2013. Natural England, a recently-established “statutory consultee” charged with advising the UK government on projects that may affect wildlife or the English countryside experience, has published a document that outlines its approach to providing guidance on wind farm siting. The guidance considers both established parks and other unprotected wild lands and geo-diversity sites, as well as areas of deep peat, and areas of hightened bird sensitivity. 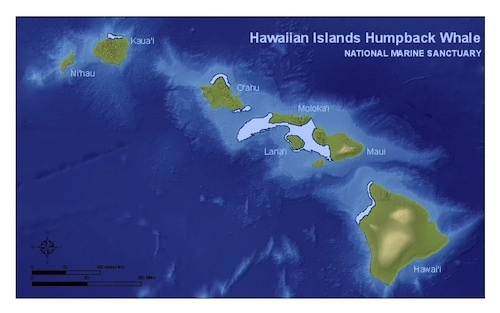 It also mentions previously-mapped areas of the greatest tranquility, though it is not clear just how much weight each of these various designations will carry as it balances the many factors that go into its recommendations. Read more about the guidance on this post at New Energy Focus, or read Natural England’s press release here. You can download the guidance document from this web page. The Acoustic Ecology Institute has published Ocean Noise 2009, the fourth in its annual series of reports reviewing new research and regulatory developments in ocean noise. AEI’s annual recaps are widely anticipated and circulated among ocean noise scientists and regulators, as well as within NGO and journalist communities. The report can be viewed or downloaded as a 45-page PDF, or viewed in the SlideShare plug-in, below. This year’s report includes coverage of two ongoing issues, seismic surveys and Naval active sonars, with particular focus on the Navy’s continuing roll-out of Environmental Impact Statements for its offshore training ranges and the targeting of Columbia University’s seismic research vessel by environmental activists. This year’s report introduces a new feature that will be of special interest to journalists: AEI Resource Collections on two topics that will be central to ocean acoustics policy and research in the coming years. 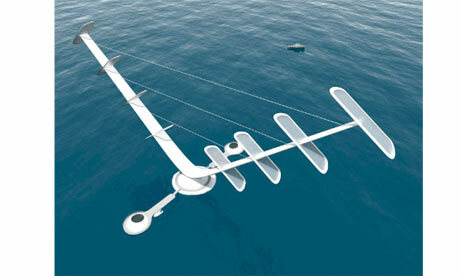 A radical new approach to offshore wind turbines is being developed by UK researchers could solve one of the major challenges of offshore wind development. The Novel Offshore Vertical Axis (NOVA) Demonstrator puts the moving parts at the bottom of the unit, greatly simplifying maintenance. (How they will deal with corrosive factors will be interesting to see!) The units are 100m tall, and are planned to generate 5-10MW; however, they are some years away, with the initial test model planned for deployment in 2015. For more on this new design, see this article in the Guardian and the NOVA website. 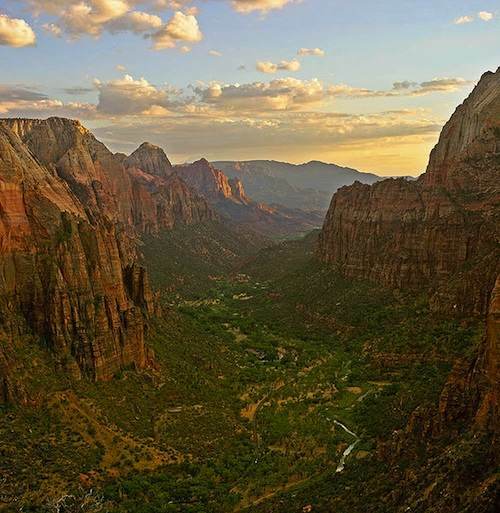 To participate in the public comment process, see this National Park planning page. You can also learn more about the Park Service’s efforts to protect natural soundscapes by visiting the NPS Natural Sounds Program website, and by reading this 2007 review of Park Service soundscape management by sound consultant Nick Miller. Here’s a bit of news that might be spun either way, depending on your predilection. Jane Davis, who was driven from her home by wind farm noise, has been compiling information on English wind farms and noise complaints; she has found that 37 wind farms have spurred some sort of noise complaints nationwide. This amounts to about 1 in 7 UK wind farms, in contrast to an oft-repeated mantra that “only four” UK wind farms had noise issues, and they’d been “resolved.” The new numbers could support those cautioning that wind farm noise issues are more widespread than generally acknowledged, AND those who claim that noise issues are the exception rather than the rule; it certainly reinforces AEI’s theme that we need to acknowledge that a minority of people are affected by noise around wind farms, and that we must come to grips with how to address this. This one slipped past me when it happened last June, but it’s well worth noting now. Complicating assessments of the risks of bird deaths at wind farms is the fact that two-thirds of migrating bird species migrate mainly at night; Cornell’s Bioacoustics Research Program, which has already done groundbreaking work in elephant communication and underwater listening systems, has proposed that combining their autonomous recording devices with radar data could provide the missing information on exactly when and where concentrations of migrating birds may exist near proposed wind farms. A compelling animation highlights the large-scale patterns: The color-coded radar map illustrates areas of precipitation over the coasts as well as vast movements of tens of millions of birds, bats and insects across the entire country. In the densest areas, the color-scales indicate movement of 2,000 birds per cubic kilometer. “You’re talking about a massive movement of birds overnight,” said post-doctoral fellow Andrew Farnsworth. Although radar data can show the magnitude, location, timing, speed and direction of migration patterns and provide information on key stopover sites, they do not identify types of birds or accurate flight altitudes, Farnsworth said. But combining radar data with data from flight call recordings and tracking tags on birds could allow researchers to identify many species in key areas. Bioacoustics program director Chris Clark added that recorders are cost effective, can be automated for many months at remote sites, provide data on many species simultaneously, increase the probability of tracking secretive and endangered species, and could allow regulatory agencies to develop computer models to assess risks to birds from wind turbines. 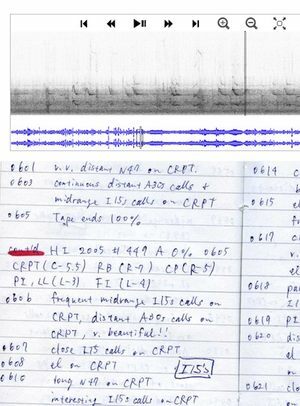 He acknowledged, however, that using such acoustic technology could produce a massive “data crunch”; a single microphone over a three-to-four-month period can record 120 to 140 gigabytes of data, so data from several hundred microphones would be too much to process without advanced software. Also, researchers would need to better recognize the wide variety of flight calls and learn to integrate data from radar with those from acoustics and tracking tags, he added. More research is needed, Clark stressed, to determine at what altitudes species tend to fly and whether birds sense turbine blades and avoid them. Read full account of the presentation in the Cornell Chronicle, with link to the radar map animation.